The MacGregor Golf Co. was founded on innovation — on the creative process of making something new from existing resources. And through the thick and thin of a storied business history, the company has maintained that particular inventive genius in golf equipment design and manufacture. It began in 1829, when the Crawford brothers founded the Dayton Shoe Last Company, in Dayton, Ohio. From shoe lasts to golf clubs? Yes, and it wasn’t as circuitous or accidental a connection as one might assume. The lasts used by shoe manufacturers were made by a copying lathe, essentially the same device by which keys are today made in a hardware store. A model of the item to be copied is secured on one side of the lathe. As it turns, its contours are passed over by a stylus. A cutting tool also secured on the lathe is connected to follow the path of the stylus. In doing so, it transforms a piece of unformed material into an exact replica of the model. The copying lathe was originally invented to form irregularly shaped rifle stocks. Eventually, it was adapted for numerous other manufactured items, including shoe lasts, baseball bats, and the wooden heads for golf clubs. In the early 1880s, two Daytonians, John McGregor and Edward Canby, became major investors in the Dayton Shoe Last Company, which now became known as Crawford, McGregor and Canby. Of the two new partners, Canby was the more dynamic businessman, but McGregor had a not insignificant role in the company’s move into the golf industry. A native Scot, he talked Canby into trying the game of golf, which at the time — near the turn of the 19th century — was practically brand new to the United States. An avid sports enthusiast, Canby liked the game. A visionary as well, he became convinced that golf would become a major sport — and business — in America. He soon began to play a pivotal role in those developments. To understand this turn of events, it is necessary to understand how wooden heads for golf clubs were manufactured until the late 1800s. It was a relatively primitive, and certainly labor-intensive technique, done entirely by hand. Beginning with a hunk of wood roughly in the shape of a thick boot and called a flitch, the clubmaker, using a saw, a chisel and hammer, a file, and sandpaper, worked the flitch down into a clubhead. He then coated it with varnish, and attached a shaft to it. This laborious process produced perhaps one finished head per day, per worker. Now, the story of how this changed, and how it brought the MacGregor Golf Company into existence, becomes anecdotal. Robert White, born in St. Andrews, Scotland, was among the vanguard of his countrymen who emigrated to the United States and became its first golf professionals. He was never much of a golfer, by professional standards, but he had a long and distinguished career in American golf that included helping found the PGA of America; he was the association’s first president. Incidentally, he also helped create MacGregor Golf. Golf pros of the time were jacks-of-all-trades — they taught golf, maintained the course, made clubs. One day, in 1894, while the professional at the Myopia Hunt Club, in Massachusetts, White was in his shop laboring over a new wood clubhead. A local carpenter, named Gardner, happened by. After watching White saw, file and sweat over his creation, Gardner remarked, “There’s a shoe factory over at Lynn where I could do that wood job of yours in two or three minutes.” Lynn, Massachusetts was then the center of shoe manufacturing in the United States. White gave Gardner a chance to match deed to word, and said later, “The fellow did turn out some beautiful clubheads.” He did, almost certainly on a copying lathe used for making shoe lasts. Apparently, White was not moved enough by the carpenter’s example to look further into how he did the work, for when he became the head professional at the Cincinnati Golf Club, in Ohio, in 1896, a similar incident seems to have occurred. This time, a member of the club saw White hacking out a wood clubhead the old fashioned way, and told the pro the work he was up to could be done better and much easier on shoe last machinery. White could see for himself by visiting the Crawford, McGregor & Canby company, a few miles up the road in Dayton. White went to Dayton and met Edward Canby, who realized an opportunity. He could turn out wooden clubheads on his copying lathes. This would provide a source of income and keep his workforce active through the inevitable down periods in shoe manufacture, when the need for lasts slowed. Furthermore, making wooden clubheads would come easily to workers generally trained in woodworking. In addition, Canby learned from a newspaper article that some 500 golf courses were in play around the country, that $50 million was invested in the game, and that over 125,000 golfers in the country were spending an estimated $10 million per year on golf. These were intriguing numbers for an enterprising businessman like Edward Canby, and in March, 1897, Canby diversified; his company would make shoe lasts and golf clubs. Crawford, McGregor & Canby got off to a quick start as golf club manufacturers. Within the first year or two, they were turning out clubheads at a rate of up to 250 a day, thanks to the copying lathe. Such production figures immediately put the firm at the forefront of the industry as it was developing in the United States. It followed that by making golf clubs more widely accessible, and affordable, the game itself could grow. And it did, exponentially, not only for Crawford, McGregor & Canby but for other manufacturers coming into the business. But where the company really enhanced its position in the new and burgeoning American golf industry was in the use of persimmon for wooden clubheads. Persimmon is an Algonquin/Creek Indian word for a medium-sized tree native to the United States, which is found mainly in the American mid-south. The wood was well-suited to shoe lasts, and because the persimmon market had long been in Memphis, Tenn., making it geographically convenient to Dayton, it was used almost exclusively by the Dayton Last Works. It was the logical wood of choice for the clubheads the company began turning out. In doing so, Crawford, McGregor & Canby’s golf fortunes were turned up another notch because persimmon was discovered to be far more suitable to golf than the dogwood and beech that had been used for clubs since the 1400s. Relative to persimmon, beechwood was too soft; dogwood, harder but brittle. Persimmon struck a happy medium. A member of the ebony family, it is hard enough but has an interlocking grain that resists splitting. It is also relatively light, and can therefore take lead filling and a metal sole plate without getting too heavy for golf. Another advantage to persimmon is that it is relatively free of knots, which makes for less spoilage in the turning process. Also, persimmon does not contract and expand as much as other woods in hot and cold weather, an advantage in that golf is played in widely varying climatic conditions. Finally, it gives a clean and smooth look when it becomes a clubhead, as well as a certain soft feel when it strikes a golf ball. All this practical and aesthetic delineation of persimmon is effectively a nostalgic reminiscence, for the wooden clubhead has been relegated to the dustbin of golf history by the metal “wood.” But back in 1900, when Crawford, McGregor & Canby was merely three years into the golf business, so prized had its persimmon heads become that it shipped 100,000 machine-turned golf heads annually to Great Britain alone. This quantity of business got CMC off very well in its new venture, and by all means established the company’s persimmon woods as the benchmark of excellence. It was a position it held for some 75 years. To this day, vintage MacGregor woods are among the most prized by golf club collectors and the few remaining traditionalists who actually play with them. There is a subtle touch of innovation in how MacGregor Golf got its name. In March 1898, Edward Canby hired Willie Dunn as his head staff professional. 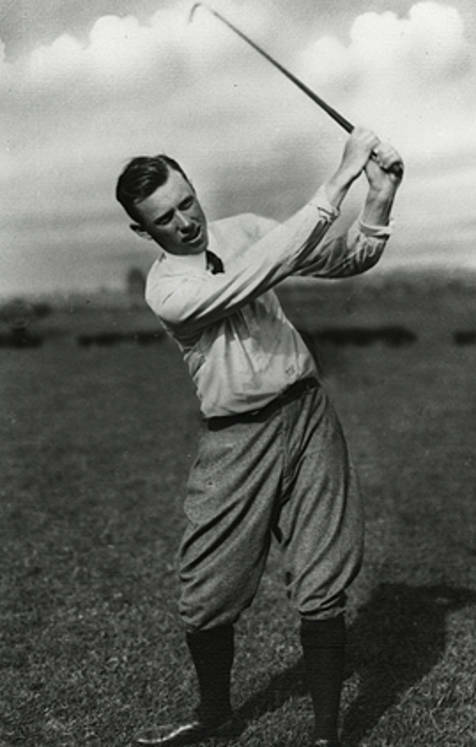 Dunn was the eldest member of a famous Scottish golfing family. He was reputedly the first golfing professional in America, was runner-up in the first US Open and was a builder of golf courses, including the original Shinnecock Hills Golf Club. Canby wanted Dunn’s golf expertise, but he also understood the credibility value a Scots name would bring to his golf division. Dunn’s name was featured prominently on the first CMC line of clubs, and in all the company’s advertising. However, the relationship between Canby and Dunn didn’t wear well, and when Dunn left the company there was the problem of keeping the firm at least nominally connected with golf’s birthplace. Canby found the solution in the next office over. He obtained a trademark, “J. MacGregor,” to be used on CMC clubs, which he could do because there was a person by that name with the firm–John McGregor, of course. The interesting thing about this is how John McGregor’s name came to be spelled MacGregor, in respect to its use by the company. The Gaelic word “Mac” was used originally by both Scots and Irish as a prefix to surnames. MacGregor is to say, son of Gregor. At some point in time, though, Mac also came to be spelled Mc. This variation came to be associated mainly with the Irish. That, along with the fact that Mickey (from Michael, the Irish Patron Saint), was a common Irish name, led to the derogatory name for Irishmen: “mick.” This word, slang etymologists say, originated in the United States around the mid 1800s, when there was a huge influx of working-class Irish immigrants who were treated disrespectfully by the English-rooted establishment. It is pure speculation at this late date, but it is likely that Edward Canby did not want his golf equipment to carry a name, however Scottish its owner was, that had an Irish connotation. Mac became a Scot-only prefix. Hence, McGregor became MacGregor. Oddly, the company was inconsistent in referring to itself. The J. MacGregor trade name was used on equipment beginning in 1900, but in the advertisements it produced, the company referred to itself as Crawford, McGregor & Canby. Editors didn’t help the matter. For instance, in a June, 1935 issue of Golfdom magazine, a headline read: “Joyce Wethered Added to the McGregor Advisory Staff.” Another newspaper headlined the news, “Joyce Wethered Joins MacGregor Golf Staff.” In 1944, the confusion was eliminated. P. Goldsmith, Sons now owned the golf company, but the president of the golf division, Clarence Rickey, decreed that it would be known as MacGregor Golf. Every great artist, from Michelangelo to Picasso, begins by borrowing if not outright copying from the works of previous masters. He then modifies, adapts and transforms the original until it becomes his own creation. This same process exists among manufacturers of products. To see the value of someone else’s work, and make something entirely different out of it, is a talent in itself — and MacGregor Golf was never short of it. For example, around 1898 a Scot named Scott took a patent on a wood club with the shaft inserted in a hole (socket) drilled in the neck (hosel). Until then, shafts were spliced around the outside of the neck and held in place with glue and a strong thread called whipping. Splicing was not the most secure way to attach two parts of a club at the point of greatest stress when a ball is hit, and Scott’s was a huge fundamental improvement in club construction. 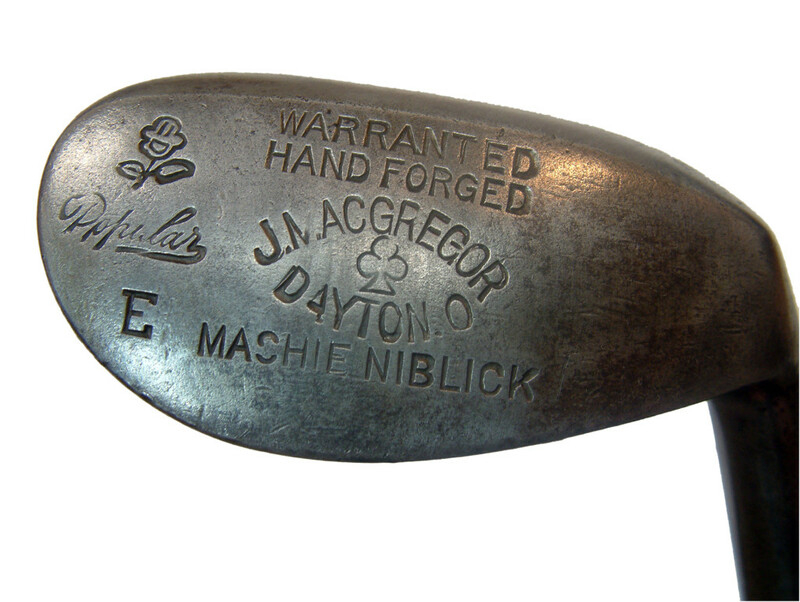 MacGregor was first to license the manufacture of golf clubs using Scott’s idea. It wasn’t long before all golf clubs were made this way, with variations to bypass Scott’s patent, which eventually was rendered null and void. The first use of inserts in wooden head clubfaces came around the middle of the 19th century, with the advent of the gutta-percha ball. Until then, the golf ball was a leather bag filled with feathers. It was not much of a threat to the condition of the clubface. The solid, hard-rubber gutta-percha, however, caused nicks and dents in clubfaces, and finally just wore them out. To prevent this, someone got the idea of putting a slab of thick leather into the center of the clubface. It made manufacture costlier, but saved throwing the entire club away when it became too guttie-worn. Irons, by the rules of golf, could not have inserts. But the idea of something on the face of an iron to provide a “target,” and to frame the ball for the golfer was in Toney Penna’s mind when he created the MacGregor “Colorkrom” MT (for MacGregor Tourney) iron, in 1955. The entire scored area of the iron’s face was bronze-colored. It was derided by some people as strictly cosmetic, but it did indeed give the golfer a good picture of where the club and ball were supposed to meet. It sold very well. By 1910, MacGregor was recognized as the preeminent manufacturer of wood clubs. The reputation was further enhanced when Will Sime was hired, in 1912. A Scot who had made clubs for Harry Vardon, J.H. Taylor and James Braid (the famed British Triumvirate of champions), Sime was signed on as MacGregor’s chief club designer. He may have been the first in the industry to ever hold that specific title. The shape of wood heads for almost as long as golf had been played was long-nosed. They looked much like a hockey stick, not surprising in that the origins of the game have been traced to a form of hockey played by the Dutch. This shape, called “long nose,” was gradually being transformed, and Sime completed the transition with a shape inspired by the shape of a biscuit his mother baked, called a bap, which was blocky in configuration. The idea behind Sime’s MacGregor “Bap” driver and brassie was that a more compact head could deliver a more solid and powerful blow. The “Bap” was introduced in 1921, and proved extremely successful. For 15 years it was the best selling wood in the MacGregor line, and owing to this success the rest of industry developed similarly shaped heads. The MacGregor “Bap” effectively revised the basic design of the wooden clubhead. The most substantive and influential development in golf equipment in this century, after the invention of the three-piece golf ball, was the introduction of the steel shaft. MacGregor was the first to use it in its equipment, and was thereby an integral part of the revolution it caused in equipment and how the game was played. Nonetheless, in the early 192Os, the British company, Apollo, introduced and marketed the first viable steel shaft. This shaft didn’t appear in the United States at the time. However, during this period, the Bristol Steel Co., in Connecticut, also developed a sound, tubular steel shaft. What made it eventually successful was that whereas the Knight, Lard and Apollo shafts were tubes with an overlap, Bristol found a way to weld a seamless tube. This made it more consistent in its performance, and more attractive to the eye. Getting the steel shaft “legalized” by the sanctioning bodies was a problem put in the hands of Harry Lagerblade, a club professional hired by Bristol to head up its steel shaft division. Lagerblade was aware of animosity toward the USGA held by the Chicago-based Western Golf Association (WGA). The WGA, founded at almost the same time as the USGA, felt the USGA was an elitist east coast group that shouldn’t serve as the Game’s central ruling body. Lagerblade thought the WGA might be interested in recognizing the steel shaft, if only to tweak the USGA, and arranged a test of it at WGA headquarters. On a cold and windy day in May, 1922, at the Edgewater Country Club, Chicagoan Charles “Chick” Evans, the great amateur champion, and two highly regarded professionals, Jock Hutchison and Laurie Ayton, hit balls with both hickory and steel shafts. In attendance was WGA president Albert Gates. The players found the steel quite acceptable, as did Gates. A newspaper account of the test also made an argument for the coming of steel, noting that it was more uniform and durable than hickory, cheaper to buy, and that with the growing popularity of golf, some 5,000,000 feet of hickory was used annually for golf clubs. In short, the hickory supply was becoming limited. This was also noted by George Mattern, the MacGregor plant manager, who was at the test site. Mattern was quoted as saying that while his firm was able to get all the hickory it wanted, it had been forced to reach out farther into the available supplies and figured that 75 percent of the usable hickory had been exhausted. For economic and supply reasons alone, steel shafts were becoming more viable, and Albert Gates announced that the WGA would permit their use in its tournaments — which were consequential. The Western Open was at the time considered a “major” title, and the Western Amateur was on the same level on the simon-pure side of the game. Lagerblade’s ploy worked. Not long after the WGA approved steel, the USGA said it would reconsider its ban, and in January, 1924 finally sanctioned steel shafts. As an example of how steel shafts drove down the cost of a quality golf club to the average golfer, and thereby made the game all the more accessible to the masses, a 1923 MacGregor catalog offered its BB Six Spot Ivory Face Brass Back Drivers and Brassies with steel shafts for $6.25 wholesale, and for $8.25 with hickory shafts. The first steel shafts were basically uncoated and subject to rusting. What is more, many golfers were still fond of hickory and complained that cold hard steel didn’t look as good as hickory, and also caused a lot of shock vibration in their hands. MacGregor found a way to keep the steel from rusting, and dampen the shock. It developed a celluloid trade name “Macoid” which looked something like wood, and helped prevent rusting. Spalding would use a similar coating, in tan, on its first Bobby Jones Signature irons and woods, introduced in 1930. It wasn’t until the auto industry found a way to make chrome adhere to steel for car bumpers that the rusting problem was completely solved for the golf equipment industry. That chroming process found its way into the manufacture of iron clubheads, and MacGregor was probably the first to produce chrome-plated irons when it introduced the “Radite No-Rust” iron, in the late 1930s. The other complaint about steel, the shock or vibration factor, went beyond mere aesthetics. Steel didn’t have the nice soft feel of hickory, and on mis-hits in particular could be painful for those who played and practiced a lot. MacGregor was the first to counter the vibration problem with its “Neutralizer,” a wooden dowel of tough spring hickory inserted in the shaft where it joins the clubhead. It absorbed shock and vibration, while also strengthening the neck of the club. Other clubmakers would devise shock absorbers of their own design. By the late 1920s, Edward Canby, now age 70, had such a good feeling of well-being and was so optimistic about MacGregor’s business future that built a 9-hole golf course on company property. The first known company golf course, it was excellent for employee morale, as they could play for next to nothing. But the course also gave MacGregor a very sound selling point in that the people who made MacGregor equipment could try out new ideas in their own “backyard!” And they did. In its advertisements, MacGregor claimed rightfully that its equipment was “course-tested.” Indeed, the MacGregor golf course in this respect preempted the test facilities of other companies by some 65 years. For all its success through the 1920s, when the Great Depression hit in 1929-30, MacGregor began to have its own hard time. By 1932 its workforce was halved, and those who did keep their jobs came in only two or three days a week. Indeed, by the beginning of 1934 the specter of bankruptcy was looming over MacGregor. Although a well-established and profitable company, it did not have the diversification of its arch rivals, Spalding, and the newer but growing Wilson Co. The latter two made equipment for a variety of games, whereas MacGregor was only a golf company. Basketball, baseball, and football were far more economically accessible to a strapped populace than golf. Furthermore, MacGregor had not established itself as a golf ball manufacturer, whereas Spalding had long dominated this end of the business and Wilson was gaining ground. People could do without a new set of clubs, or make do with what they had, but balls, which didn’t cost all that much in the first place, were regularly lost or beat up. Spalding and Wilson could count on getting business whenever golf balls were sold. At the same time, Edward Canby, who had become MacGregor’s controlling stockholder and chief operating officer, was at an age (80) when he could no longer handle the day-to-day stress of running a large business. With neither his son or grandson suited to take over the concern, and facing the prospect of simply closing down a business he had proudly grew to prominence, Canby called in a Cleveland management consulting firm, Robert Heller, Inc., to put MacGregor in shape for sale. This last-ditch effort proved to be one of the most providential decisions Canby ever made vis-a-vis MacGregor Golf. Robert Heller, Inc. assigned Clarence Rickey to the MacGregor project. Rickey’s father was a cousin of Branch Rickey, the progressive major-league baseball executive who broke the color barrier when he signed Jackie Robinson to play for the Brooklyn Dodgers. Clarence was himself an athlete, earning a football scholarship to Northwestern University. After military service in World War I, he played professional baseball and eventually became a sporting goods salesman. A physically imposing man with a quick mind, and what Byron Nelson would describe as a “flamboyant” personality, Rickey took on the MacGregor job with gusto and a clever business sense. He decided that MacGregor was still a premier name among golf consumers, had the best bench trained clubmakers in the industry, and with some fresh approaches could come back to prosperity. Not long after Rickey arrived on the scene. Edward Canby died. This forced the issue of selling the company. Two firms bid for it, Wilson and P. Goldsmith and Sons. Rickey recommended Goldsmith, feeling that Wilson would simply dissolve MacGregor and eliminate a major competitor. Goldsmith was a full-range sporting goods manufacturer that had tried unsuccessfully to get into golf, and felt this would be the best way. Goldsmith got the prize, with the proviso that Rickey stay on as president. The deal was done in 1936.